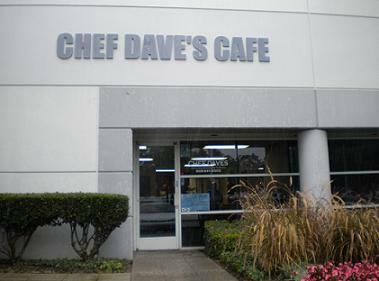 Chef Dave’s is in a nondescript office park, as the photo indicates, there primarily to serve nearby workers and do catering. The cafe interior has a bit more individuality, with burgundy tablecloths and paintings on the walls, but it’s slightly bare, indicating that dining-in is only one component of the business. This first-timer went there for lunch on a rainy Tuesday and was the only diner, although two people came in for takeout. Someone alerted me to this place a while back, recommending the gumbo. The menu, which is written on a chalkboard, changes frequently, and there was no gumbo this week, alas. Dave’s has a bistro-type menu and feel, with hot and cold sandwiches and salads, nothing more expensive than $6.89. Customers order at the counter. I ordered the jerk chicken sandwich ($6.89) and an iced tea. I didn’t know what to expect, but the sandwich was a pleasant surprise, mildly spicy and accompanied by onions and cheese. A few pieces of grilled pineapple made a nice garnish. Open weekdays only from 7 a.m. to 3 p.m., they do lunch and a few breakfast items. 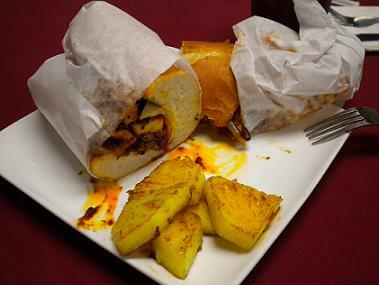 If you want to ask what’s on the menu, phone (909) 941-0303. While I wouldn’t recommend driving across town to eat here, if you find yourself in the neighborhood — it’s a block east of Haven and just south of the new underpass — Chef Dave’s is worth hunting down. He also was the Executive Chef when Saffron first opened in Guasti. He has catered a few chamber of commerce events in the last year. Good luck Chef Dave. Glad you are on your own!